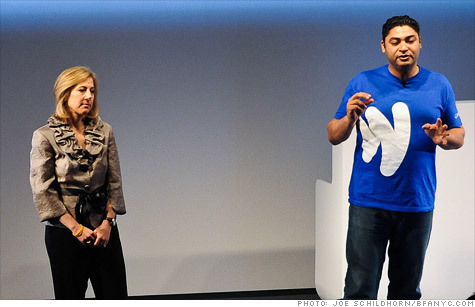 Former PayPal employees Stephanie Tilenius and Osama Bedier announce the launch of Google Wallet in New York, Thursday. PayPal is suing them, and Google, for stealing its trade secrets. NEW YORK (CNNMoney) -- PayPal is suing Google for allegedly stealing its employees and trade secrets that may have led to the launch of Google's mobile payment service. The 28-page lawsuit, filed in a superior court in San Jose, Calif., late Thursday, accuses Google (GOOG, Fortune 500) and two former PayPal employees who now work at Google of implementing PayPal's confidential trade secrets related to mobile payment technology. The lawsuit came on the same day Google unveiled a phone-based mobile payment system, called Google Wallet. It specifically mentions Osama Bedier and Stephanie Tilenius, who -- now at Google -- took to the stage yesterday to unveil the new technology. For two years, PayPal and Google had been in negotiations for PayPal to provide the payment system for Google's app store on Android phones. But the lawsuit claims Google put a kibosh on the deal to instead "build a competing product with PayPal's former employees and executives at the helm." Google issued a statement Friday, saying it will fight the suit. "Silicon Valley was built on the ability of individuals to use their knowledge and expertise to seek better employment opportunities, an idea recognized by both California law and public policy," a spokesman wrote in an e-mail to CNNMoney. "We respect trade secrets, and will defend ourselves against these claims." PayPal's chief complaint is with Bedier, who worked at PayPal for eight years overseeing new product development of mobile technologies before he made the switch to a similar position at Google earlier this year. While he was at PayPal, Bedier was in charge of negotiating the PayPal-Google deal. But PayPal claims that during those negotiations, Bedier was simultaneously interviewing for a job at Google, breaching his responsibilities as an executive. The lawsuit goes on to accuse Bedier of transferring important company documents to his non-PayPal computer just days before leaving PayPal for Google in January. PayPal also accuses him of recruiting other PayPal employees after his departure and using PayPal information on Google sales calls. The lawsuit also claims that Google had reached a deal with PayPal regarding its Android Market negotiations in February, and the deal had even been inked by Android chief Andy Rubin and Google's then-CEO Eric Schmidt. But Google stalled in notifying PayPal, and three days after Larry Page took over as Google CEO in April, Google "scuttled the deal for good," PayPal alleges. The lawsuit also includes charges against Tilenius for violating her contract with PayPal parent company, eBay (EBAY, Fortune 500), by recruiting Bedier over to Google. Tilenius worked at eBay for eight years before moving to Google in 2009. The lawsuit claims she was obligated by contract not to recruit eBay employees until at least March 2, 2011, but she reached out to Bedier through Facebook and shepherded him through Google's interview process last year. At least two more employees, the lawsuit claims, have since resigned from PayPal to join Google.